A smartphone may still be just a phone, but consumers expect more from the device. For example, a smartphone also doubles as a camera. And if manufacturers are going to place good cameras into their phones, it just makes sense that consumers have a way to edit their photos. Mobile photo editing has therefore caught the attention of both veterans in the field, such as Adobe, and newcomers, such as FxCamera. It doesn’t matter if it’s an iPhone or an Android phone: there are plenty of options available to edit photos. Photoshop Touch. 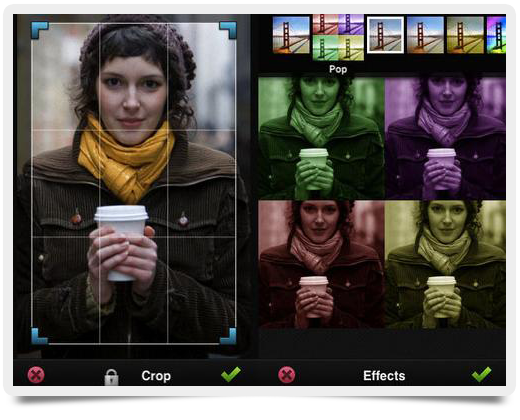 This app lets users play with many of the core Photoshop tools they are already accustomed to. Photoshop Touch is a little pricier than some of the other apps, but consumers are getting an app they’re familiar with from the veteran of photo editing. FxCamera. FxCamera lets users apply different effects to their photos. Many of the effects can also be found on other apps, but this tool has incorporated many of the best features, such as the Symmetry, Fish Eye, and Toycam effects. PicSay. This is a fun little app that allows users to add word balloons, titles, and clip art to their photos. PicSay can also distort, spotlight, and pixelize photos. Photoshop Express. Although Photoshop Touch also works for the iPhone, Photoshop Express is free. Some of its features include Crystallizing, Auto Correcting, and Burning. There are also add-ons that can be purchased from the App Store. Filterstorm. This iPhone- and iPad-specific app is the full package. It does what most other editors wish they could. It has an easy-to-use interface allowing users simple and quick access to all of the editing tools. Filterstorm also tracks all edits made by the user. The app allows users to create an automation that shows the change, and it allows the user to go back and undo the edit. With enhanced editing and masking mastery tools, Filterstorm is clearly one of the top mobile photo editing apps on the market. PhotoGene. PhotoGene was originally designed to work for the iPad, but now there is PhotoGene2, which works for the iPhone. This app actually has more options than Filterstorm, but its lack of accessibility and ease of use is its downfall. It is a great app and has been one of the best sellers at the App Store for the last couple of years, but it comes with a bit of a learning curve. Mobile photo editing apps are still in their infancy, and as the phones become more sophisticated, so will the editing software. This year alone finds the apps passing information between Bluetooth devices and creating special effects that used to be considered a computer’s job. Listed above are some of the best apps currently on the market, but don’t be surprised to see new ones popping up very soon.